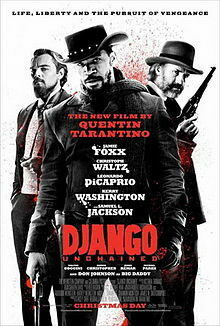 Most definitely a new Tarantino cult classic!.. Good action… Nice plot… Great suspense… Good Comedy… Long movie but it keeps your attention… The only problem was the authenticity of Foxx’s slaveness, sometimes good, sometimes bad. Grade A. Got to admit had low expectations but Tarantino didn’t disappoint… Jamie Foxx great job as well… Good action… Humor, not too much gore… Great movie. A.